I meant to write this post a couple of days into the new year, but a couple weeks is ok, too. I want to share a few thoughts about my 2014 daily drawing project with the NeoLucida, a portable optical drawing aid. This project came from a simple premise: I wanted to teach myself to draw. I had been thinking about daily art practice and, when I received my NeoLucida as a reward from the Kickstarter campaign, seized on the challenge of a drawing a day. I was frustrated as an artist. 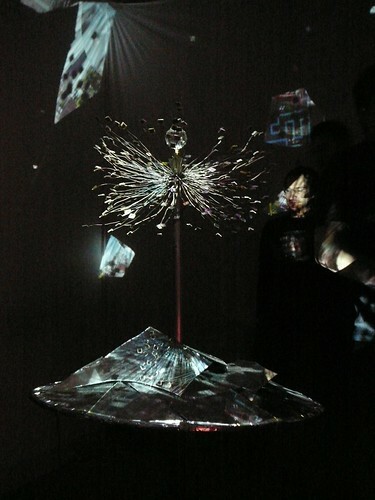 Creating video art and projections with a computer is often a battle with software. I wanted a daily practice with a daily result. Make a drawing. Look at the drawing. You made a drawing. From the beginning, I kept it as simple as possible: one pencil, one postcard, one drawing each day, and, for the first 30 or 40 days, I purposefully did not seek out drawing tips, or look for drawings by others using the NeoLucida. (I was a bit nervous about letting it get complicated or psyching myself out.) I posted my drawings on Flickr and Twitter. After a few months, on my birthday in April, I let loose a bit and bought myself some new pencils of varying hardness, colored pencils, and art paper (at that point my wife’s collection of old postcards was running low!). From then on, apart from experimenting with different lights and getting a kneading eraser, my tools remained the same for the rest of the year. Some days it felt like a chore, especially at the end of a long work day, and I’d sketch something as quickly as possible before bed. Other times I could really lose myself in the drawing, giving it as much time as felt right. Looking back, overall, it was satisfying. Being able to draw an object in perspective is, I gather, a rather difficult thing to learn. Having that leg-up of being able to quickly outline or draw reference points for the shape of a thing is quite an advantage. In other words, it’s a great way to learn to draw. If you’re just getting started using a NeoLucida, I recommend getting two bright lights with built-in stands and fairly wide beams: one for the subject, one for your paper. It will make it much easier to light things properly and get used to the device — an 80W bulb on the ceiling just won’t do. As a filmmaker, light is one of my most important tools and likewise was crucial to my learning to draw with a camera lucida. In film lighting is important, but drawing has taught me how much more latitude I have behind a camera. With the NeoLucida, I learned that I had to use light to reveal contour, contrast and texture to attempt to capture three dimensions in two, which has made me even more attentive to using light to add depth and reveal character in my video work. I didn’t draw as a social exercise. At the start, I wondered whether I would discover and join a community of other artists, using the NeoLucida or no. That didn’t happen, though I did receive support and advice from a notable few. My wife’s aunt, a talented painter, gave me words of encouragement and reflection on technique and media. Pablo Garcia, co-creator of the NeoLucida, who I met at a talk he gave at Kickstarter headquarters in May, was both encouraging and inspiring. He was excited that I was using his creation so frequently and, as an art teacher and collector of antique cameras lucida, had many helpful tips to give. My friends Andrew and Ilan responded to me on Twitter with tips, praise and discussion. A few weeks before I met Pablo, I had started reading Secret Knowledge by David Hockney, in which he lays out the theory that optical devices (mirrors and lens) were used by European artists from the Middle Ages until the advent of photography. In his own practice with a camera lucida, he would make a series of quick reference marks of the subject, e.g., eyes, nostrils, lips, ears, to get the proportions, then use his naked eye for the rest. I challenged myself to do the same, which opened up a new level of experimentation with line and shadow. It changed the way I go to museums. Now, on top of seeking out video art, I’m checking out the Vermeers, Rembrandts and other old masters. I’m not looking for evidence to support the optical device argument — I’m a believer. I look for inspiration. As Hockney says repeatedly in Secret Knowledge, “optics do not make marks, only the artist’s hand can do that, and it requires great skill.” The beauty that Medieval and Renaissance artists could achieve with paint and brush, and a little perspective help from a concave mirror or convex lens, is astonishing, but it took WORK. Craftsmen hacking their way to greatness, working as quickly as possible, depending on patrons and wealthy men and women wanting a sliver of immortality to hang on the wall. If I could talk to the me of last year, I would challenge him to take on more challenging subjects, more often. More portraits. More human bodies. More landscapes. The first time I took the NeoLucida outdoors, on a hike upstate overlooking the Hudson River, I clamped it to a clipboard on my knees and struggled to see through the prism. The field of view through the NeoLucida is quite small, which I imagine frustrated quite a few Kickstarter backers. I gave up and drew it freehand. Later on, I did a few more landscapes, most notably on a retreat in Vermont, on a board clamped to a tripod. It was another reminder that drawing is as much about what is left out, capturing the essential and re-composing the scene. For the most part, I drew at our kitchen table, one object at a time. I did draw portraits, but mainly from photos on an iPad. I drew butternut squash many times. Speaking to you and me now, I’ll say this: I’m not done. This year, whether every day or not, I’ll be drawing. I’m going to finish reading Drawing on the Right Side of the Brain. I started it early last year, then realized that its exercises were incompatible with using the NeoLucida. I’m going to use the naked eye, and explore viewpoints beyond single point perspective. I’ll continue to use the NeoLucida when it feels right. Most of all, I’ll hold on to the importance of dailyness and reflection in the process of making things. Thank you, Pablo. Thank you, Golan. Thank you, Beeple, for the Twitter challenge to make something everyday. Thank you, David Hockney. And, always, thank you, Emily. On January 1st, I started a drawing-a-day project using the NeoLucida, a portable camera lucida drawing aide. Now that I’ve passed the 40 day mark, I thought I’d share a few thoughts about the experience thus far. Background: I have never taken a studio art class. My one previous attempt to learn to draw with the help of my grad school advisor fizzled out, despite his expert and eager advice. I’ve long been fascinated by the things I’ve read and seen about the (speculated) use of the camera obscura and other optical devices in the works of medieval and Renaissance painters. When I first heard about the NeoLucida Kickstarter, I knew immediately that I wanted one so I could try the method myself. And when New Year’s Day rolled around, it seemed like a daily art project would be a good thing for me. The shape of the project thus far is this: one drawing on a postcard once a day, done with the pencil that came with the NeoLucida, which I hope to wear down to a nub. Most of the drawings have been still life tableaux, with a few exceptions (our cat, Emily’s hand, my choral group taking a break mid-rehearsal) — I wanted to keep it simple to make it easier to maintain the practice. The field of view of the prism is fairly small, making it simpler to draw small objects, and I’ve enjoyed the documentary angle of capturing little things from daily life. I set myself other restrictions for the first 40 days, such as not buying art supplies or Googling for drawing tips with the NeoLucida (or without), all of which boiled down to Keep It Simple, Stupid. (Some days I feel like I should have that tattooed on my forehead, backwards.) The postcards have almost all come from Emily’s extensive collection of postcards she’s either bought or scooped off free postcard racks over the years. There are some pretty funny ones from her college days in Montreal. Going forward, I want to try more difficult subjects (requests welcome — and I’ll mail you the card once I scan it! ), learn a bit about drawing techniques, and perhaps get some softer pencils and a fancy eraser. Lighting is crucial: try and light your subject and paper at equal brightness. By extension, if you’re drawing a darker part of the subject, turn down the brightness on your paper. I use a Litepanels Micro light on a Gorillapod as my key light and a flashlight laying on the table at varying distances from the paper (to control the brightness), but studio lights aren’t necessary: anything relatively aimable/controllable will work. Brightness decreases in an inverse square relationship with distance: move your lights closer and farther from subject and paper to balance the light levels. For your first few drawings, tape down the paper and be careful not to knock the gooseneck. Getting the paper and prism back in the same relative position when halfway through a drawing ranges from tricky-but-doable to guess-the-drawing’s-done-now. Be sure to follow the instructions that came with the NeoLucida and experiment with the prism orientation and whether it’s mounted on the left or right side — find what works for you. If you have both glasses and contact lenses, wear contacts when you draw. If you only wear glasses, use their Prescription NeoLucida guide to mod yours — Sugru’s great stuff and very easy to work with. Post your work online! I’d love to see it and it helps keep you going to share it. Email, tweet or bookface me. UnitedVisualArtists » Speed of Light. A beautiful installation done with lasers. Excuse me — forgot this was the the Internet — I meant, LASERZ. United Visual Artists are a UK-based team who create live visuals and interactive installations with an architectural bent, meaning, not just the usual glowing rectangles: really striking work. As I tweeted moments ago, I can haz laserz, too? I’m tired of weak projectors on dingy screens. Recently my friend and collaborator Josephine Dorado invited me to speak with her Social Media Mashup class at The New School, which I was delighted to do. The conversation (on Seesmic) ranged across a variety of topics, including improvisation vs. structure (in my work and live visuals in general), visual performance tools, and how my own background as a theater/comedy actor has impacted my live visual work. Now that the class is moving on to another topic, I’m posting this here for anyone who’d like to keep the conversation going, e.g., ask me all the heavy, technical questions I said I’d answer later. 😉 Thanks again, Josephine, Barb, Tom, Debbie, andrihatesjazz, Cecelia, Antoine, Rick and all you lurkers. Happy holidays!